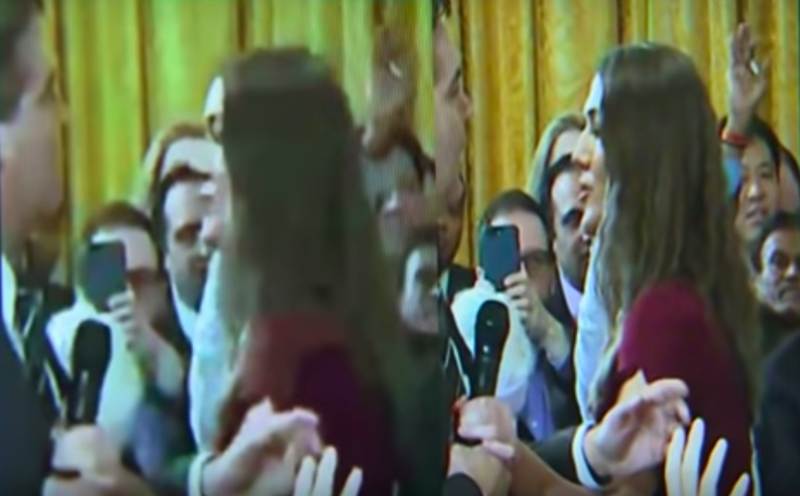 Video expert Abba Shapiro told the Associated Press that he believes the White House circulated a doctored video of an interaction between CNN reporter Jim Acosta and a White House intern. In the above video, Shapiro walks frame by frame through the AP's unaltered clip of the incident and the clip of the incident that the White House circulated. The beginning of the clip has extra frames that would be indicative of an alteration to slow the clip down, and then the actual moment of the incident is sped up to make Acosta's actions look more aggressive than they actually were. On Wednesday, a White House intern tried to take a microphone away from the Acosta as he was asking President Trump questions that the president didn't want to answer. Acosta held on to the microphone, but how aggressively he held that microphone has been in dispute. White House Press Secretary Sarah Sanders accused Acosta of "placing his hands" on the intern, although the video Sanders shared doesn't appear to support this, and the Reuters reporter next to Acosta says he merely saw the reporter hold on to his microphone. The White House revoked Acosta's press badge and tweeted a video of the incident. CNN says the White House lied about the nature of the exchange. Organizations like the American Society of News Editors, the Associated Press Media Editors, and the Online News Association have demanded that Acosta's press badge be reinstated. Enlarge / Shapiro says the video on the left appears blurry because it's slowed down and then sped up. The video is altered, Shapiro told the AP, to make Acosta's actions as he held on to the microphone look faster and more aggressive. Shapiro noted that one first indicator that the video is not an original is that the sound has been removed, which makes it easier to alter frames. Next, in a frame-by-frame comparison, several extra frames appear toward the beginning of the video, which would be true if a video manipulator was trying to slow the video down. Someone might do this if they later want to speed the video up, to keep the clip and its original a similar length. Sure enough, the White House's clip appears sped up during the actual exchange between Acosta and the White House intern. "It's just like in the movies and television, when you see something, faster action, it feels more aggressive," Shapiro said. Video producer Jamison Hermann separately told The Verge that he suspected the clip was doctored after analyzing the press version of the video and the While House's version of the video frame by frame. Aly Colon, a professor in journalism ethics at Washington & Lee University, told the AP: “The irony of this White House video involving Jim Acosta is that if it is found to be doctored, it will show the administration to be doing what it accuses the news media of doing—engaging in fake information."